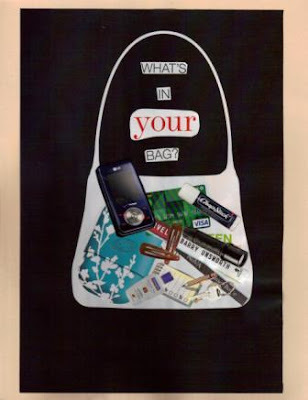 a home for my heart: What's in your bag? Lost Boy and I did some collaging a while back. It was hard to find stuff I really actually carry. this a great collage idea! I should see if my girls would like to do this with their keepy busy backpacks full of goodies they take in the car/ on errands/ to appointments. i have no idea what's in those things! it's be a fun project! Thanks! I found most of the stuff in teen magazines, but they're not my favorite to go through. I think Real Simple has great images of useful collaging stuff. What other magazines are good for collaging?